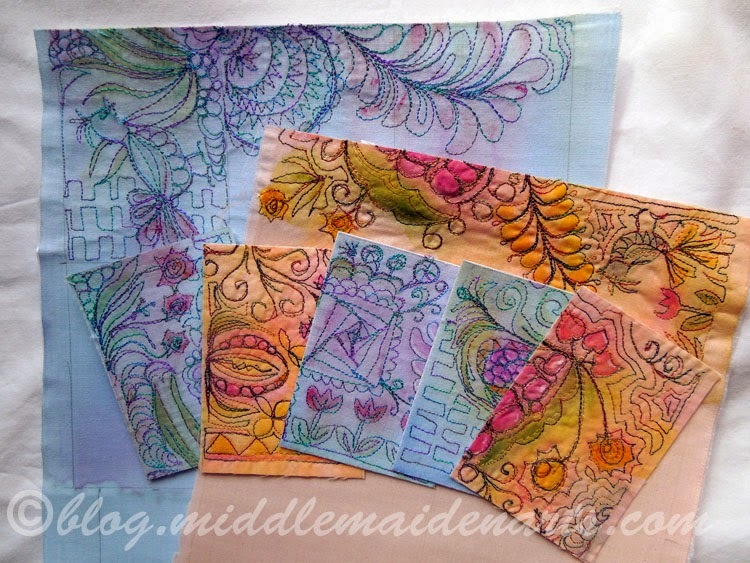 I taught a fun, relaxed Zentangle class last Saturday with a great group of gals. I changed up some of the tangles used from the usual beginner tangles. To decide which tangles, I look for those that are examples of things I like beginners to learn. I’m always surprised at how time flies and how much more I want to share. 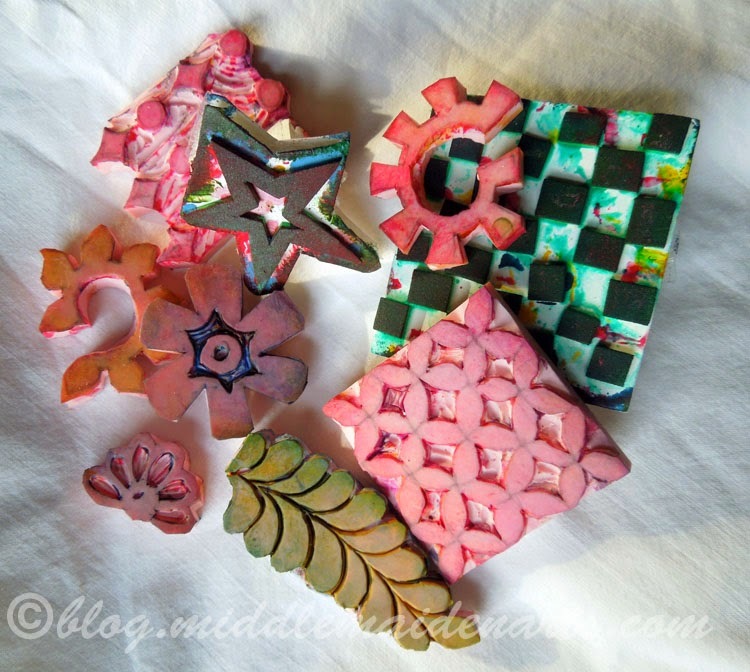 This is my demo tile on 12″ x 12″ scrapbook card stock. 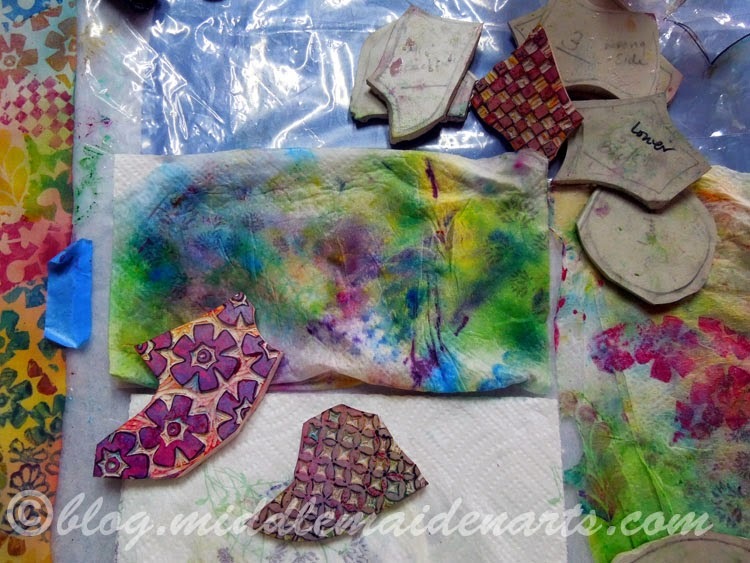 On the left is where I stopped after demonstrating the process. On the right is my final after looking at it the next morning. I’m still really tempted to put an aura on the purk. These are the student tiles. I love how they turn out so uniquely. 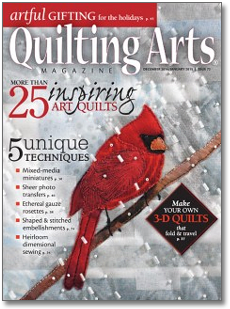 The local quilt guild that I belong to is presenting A Day of Workshops on Friday, June 20, here in Orofino, Idaho. The registration form and workshop brochure is available on the page. 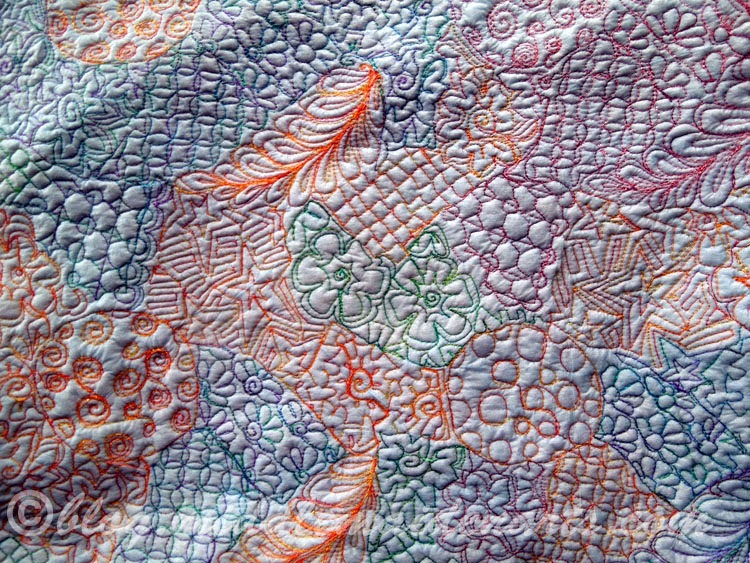 We’re delighted that art quilter Lisa Curnutt has agreed to be our featured quilter and present a trunk show of her stunning quilts at lunch time. I will be teaching Playing with Color, Value and Color Intensity for one class and Introduction to Folk Art Wool Embroidery for another. All instructors belong to our quilt guild. 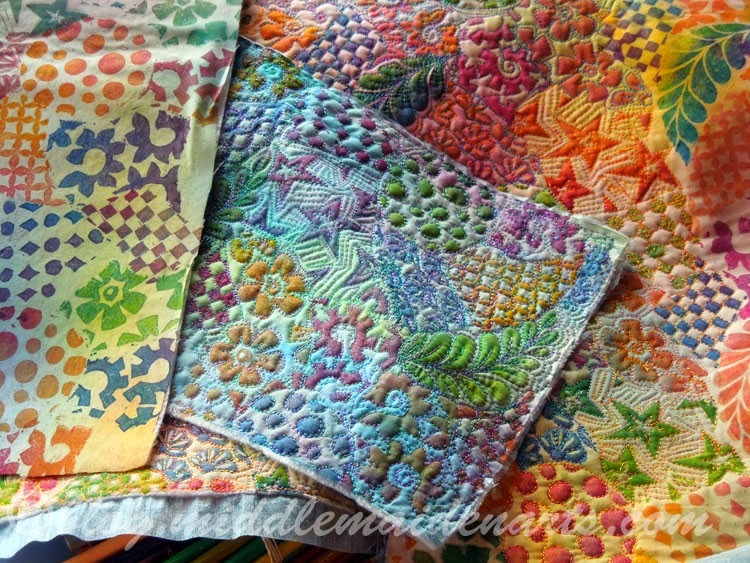 This event is in an alternative to our bi or tri-annual quilt show. We’re interested to see how things work out since we’re making it up as we go! We expect to get a lot of mileage out of “Well, this is our first time”! So far we’re getting an enthusiastic response. 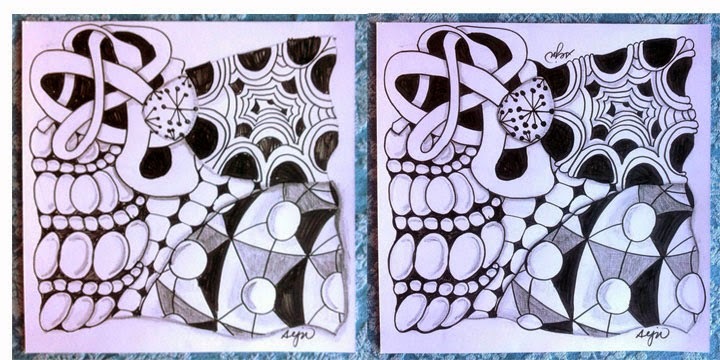 I’ve recently completed my artist trading cards for the Certified Zentangle Teachers 52 Card Deck Swap. Artist Trading Cards (ATC) are 2.5 inches by 3.5 inches and are swapped or exchanged for the pure fun of sharing the artwork. 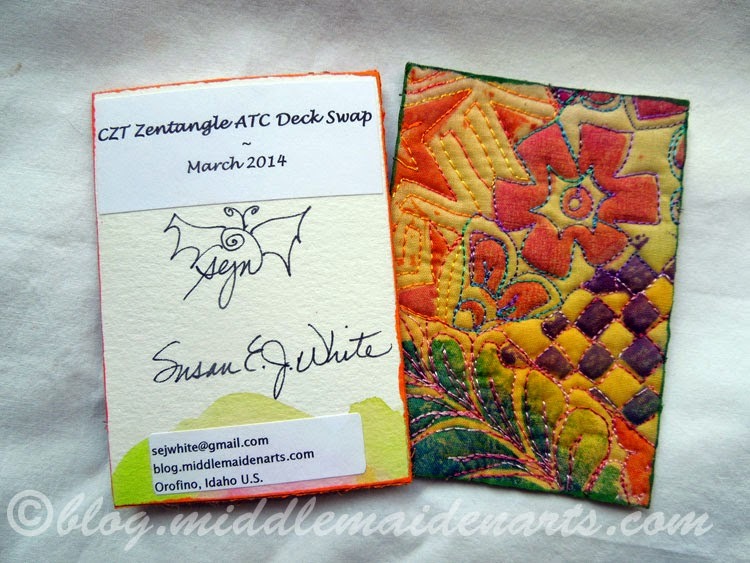 For this swap, any type of media was allowed as long as it involved Zentangle®. Warning – I love process and the figuring out of it. This could get long but I do have photographs! I started my ATC’s by mapping out a 2.5” by 3.5” grid in pencil on an 18” by 24” 90 lb. cold press watercolor paper. I’m a creature of habit and one of my habits from my weaving background is to create samples before totally committing to a process. I laid in a colorful watercolor wash background and then began to draw. Two or three cards later I decided I wasn’t inspired to continue this way. 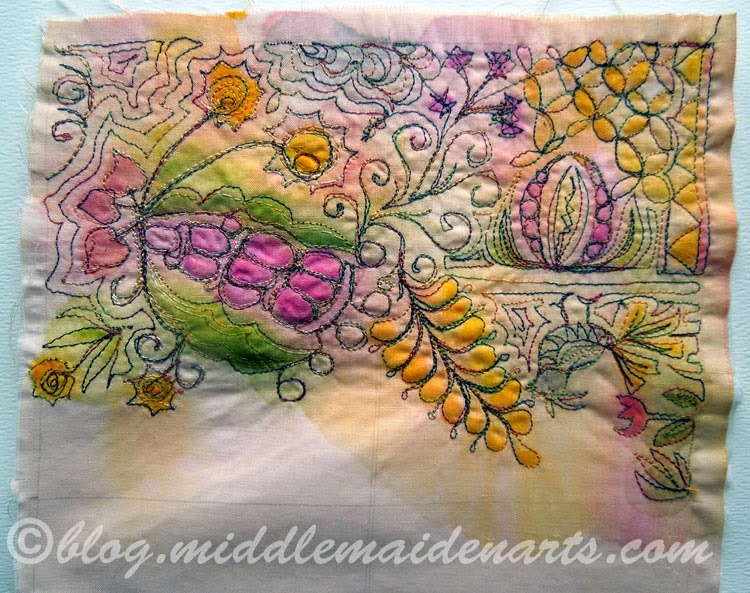 So what about free motion stitching tangles on a watercolor washed fabric? I thought I could do that. Time for another test. I pulled out some very pale, plain cotton cloth in assorted colors and used Setacolor Pebeo fabric paints in a thin watery wash. After heat setting two sample fabrics, I fused a different stabilizer to the back of each and mapped out the 2.5” by 3.5” grid lightly in pencil. 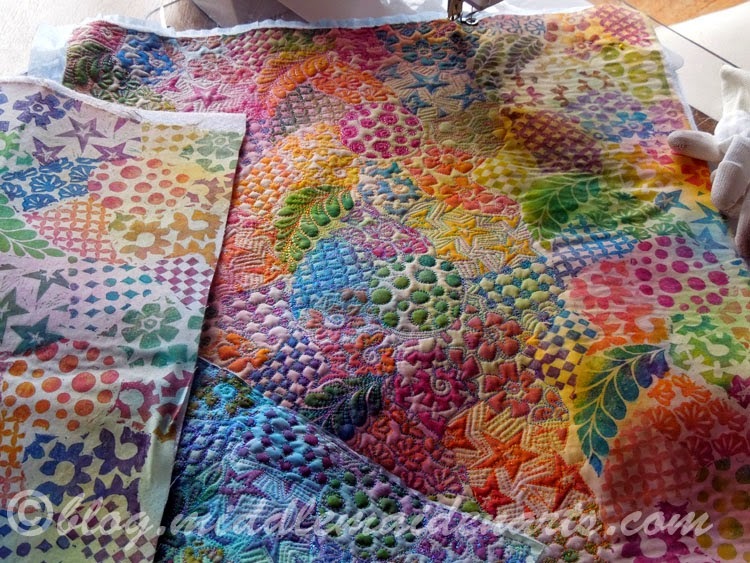 I used Superior Threads variegated thread to stitch this test and really liked the resulting color play. I decided to see if I could boost the color next to the stitching to enhance the tangles so I experimented with my Prismacolor pencils. This really helped bring the surface to life. From this test, I learned that I tended to want to stitch inside the grid instead of ignoring it and it was slow going to think up every tangle as I went. I also re-learned (been here once before) that when you do a lot of stitching in a small area you shrink up the fabric. My pre-drawn grid had shrunk to less than 2.5” by 3.5” and I couldn’t erase the pencil. Watercolor pencil might be something to consider for the future. I thought, “I can do this”. Next, how would I stiffen the cards so I could put information on the back? 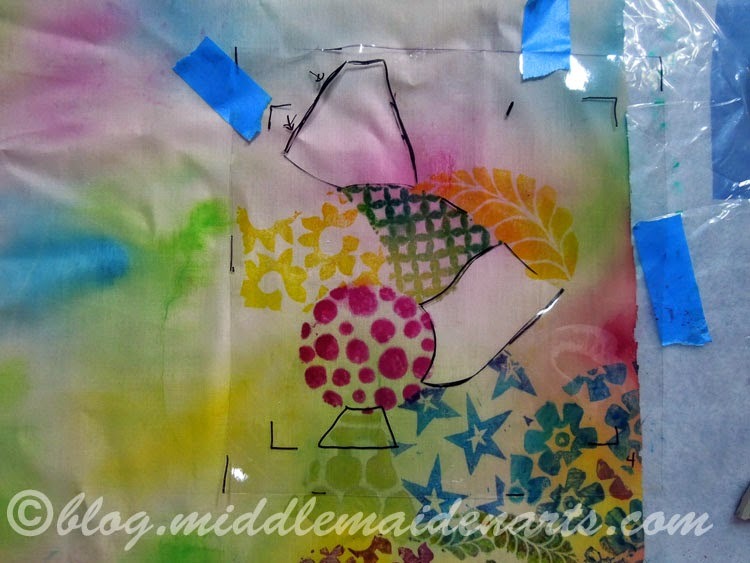 Use fusible web and watercolor paper. Yes, I decided to forgo the visibility of the stitching on the reverse so I could sign them and apply labels. Yes, I tested this too using 90 lb. watercolor paper and then cut my first samples out. More proof that I should always test things and firm up the process before I go too far. Here’s what I learned. 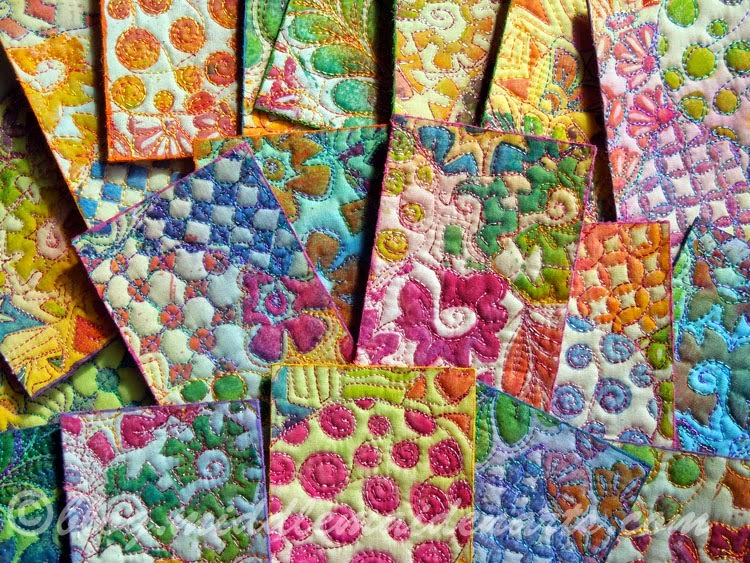 I preferred the slightly puffy fusible interfacing as it made the cards more quilt like and interesting. 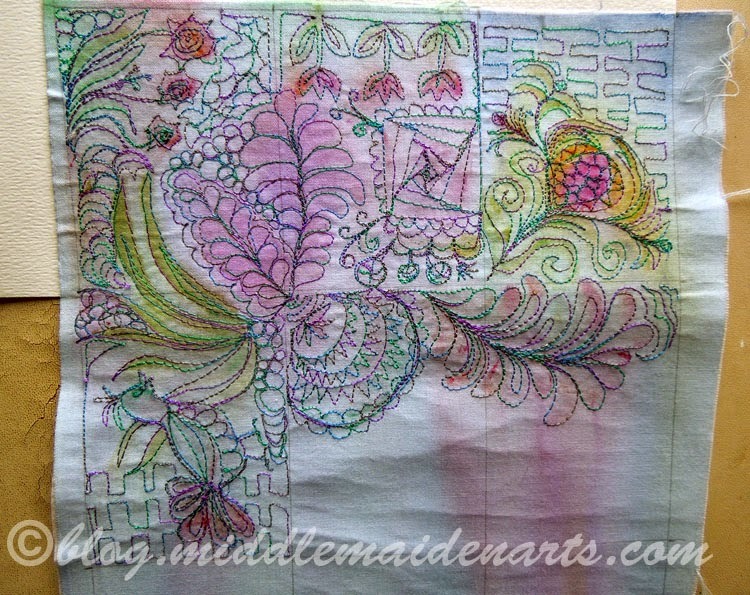 I also found that I preferred to use the color pencils before fusing the interfacing. The little glue dots on the interfacing created a bit of a pattern on the fabric that I didn’t like and even extra heat didn’t make them melt away before adding color pencil. Around this time, I came a cross an image of fabric on which someone had stamped and stitched. Hmmm… time for another experiment. I pulled out some small stamps created for a previous project. I applied the stamps in clusters, let the fabric dry, heat set it again, and stitched around the patterns with my variegated thread. I decided to add another layer of thin interfacing to the backside to enhance the stitch quality. Pretty enjoyable. 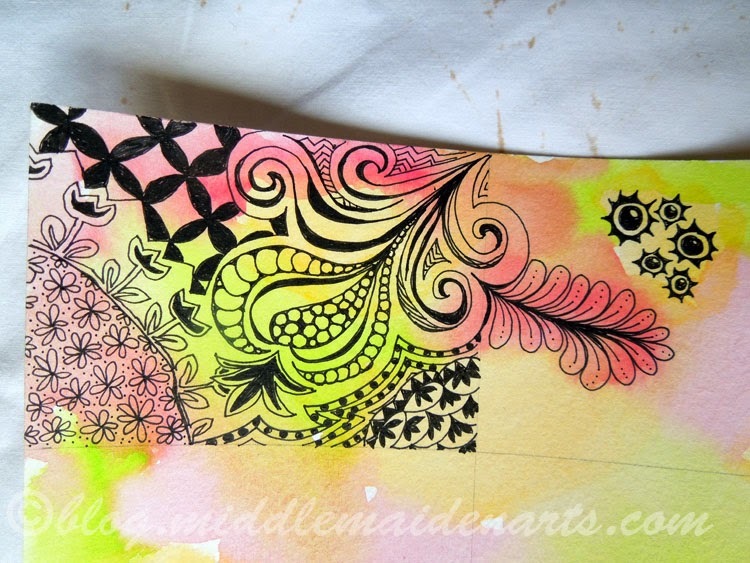 Next, how do I make it more Zentangle like and pick up the pace? 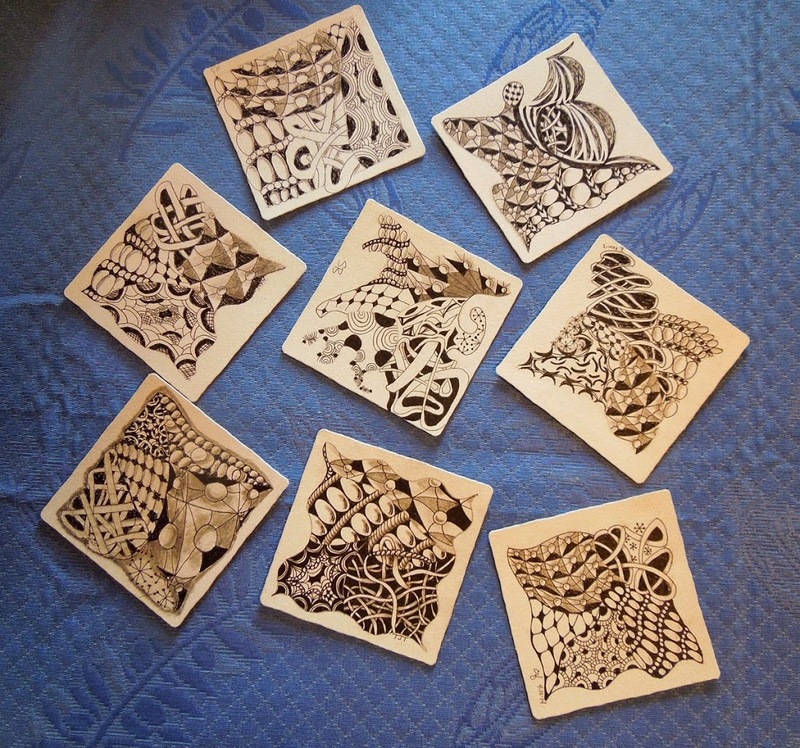 Well, maybe I could make a repeating string (Zentangle term) based pattern and stencils to stamp through. What? First, I decided on a string in a roughly 8 x 8 inch square, avoided the edges, and turned it into a repeating pattern. 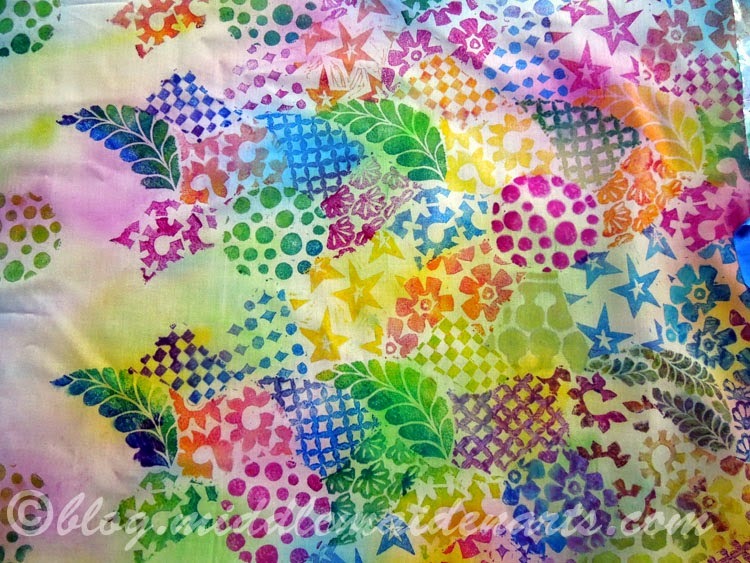 From that I created a stencil (5 layers) that I could stamp the tangles/patterns through. I had my process, tools, fabrics and a plan. 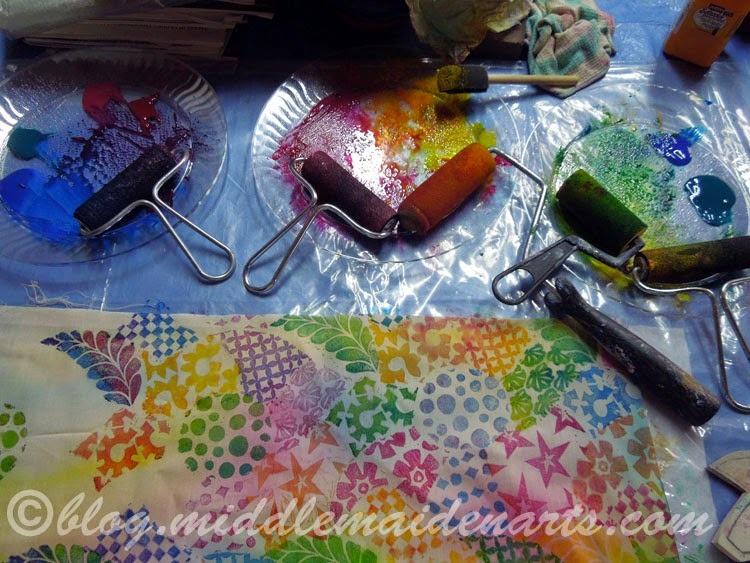 It was still slow going but I enjoyed barely blending the fabric paint colors on plates, using my carved stamps and watching the patterns develop. 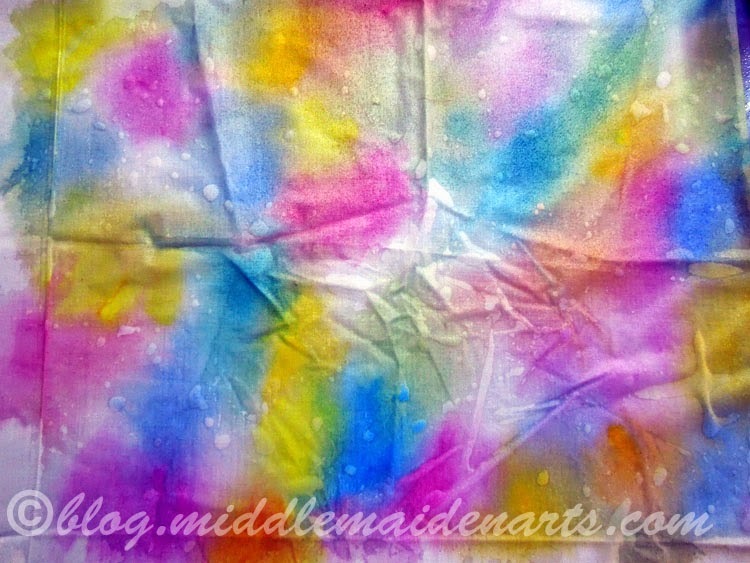 Fabric with very wet wash of colors. One layer of the stencil is visible in the picture below. 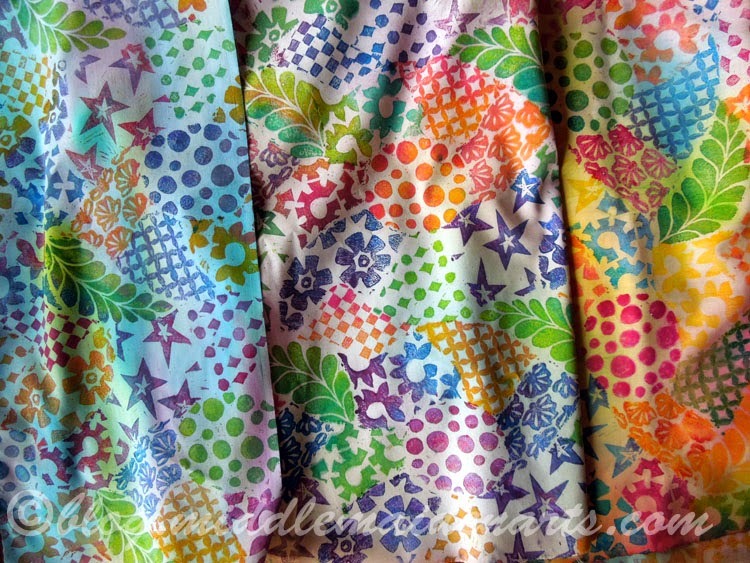 Once the fabric was all stamped and heat set with an iron, I boosted the color in some places with my pencils, fused the interfacing to the back, and added another layer of thin, non-fusible interfacing to the backside. 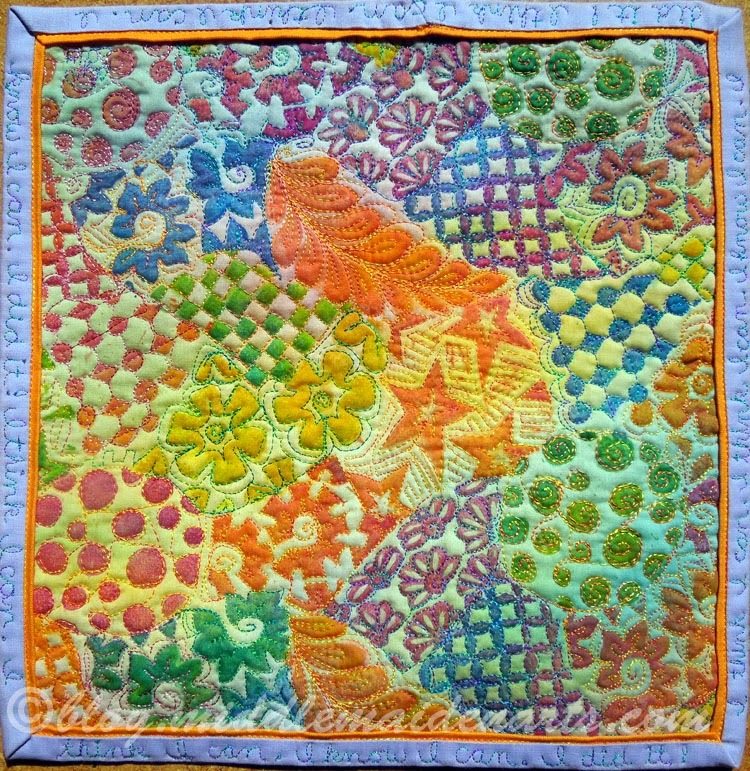 I used a variety of Superior Threads variegated threads to free-motion stitch with. With stitching completed, I used Heat ‘n Bond to fuse large pieces of 140 lb. 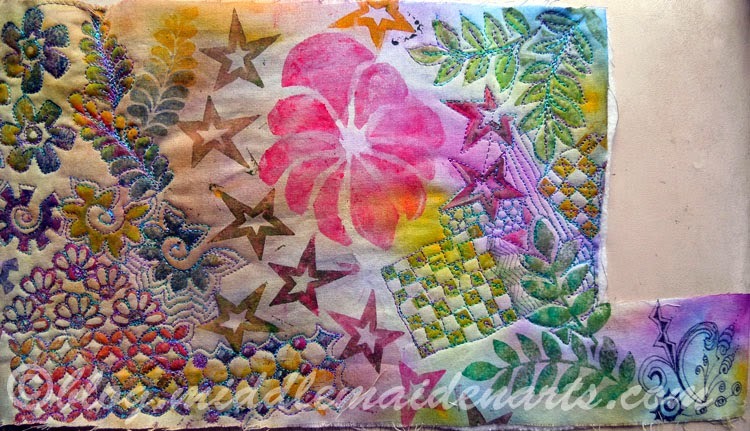 watercolor paper to the quilted fabric. 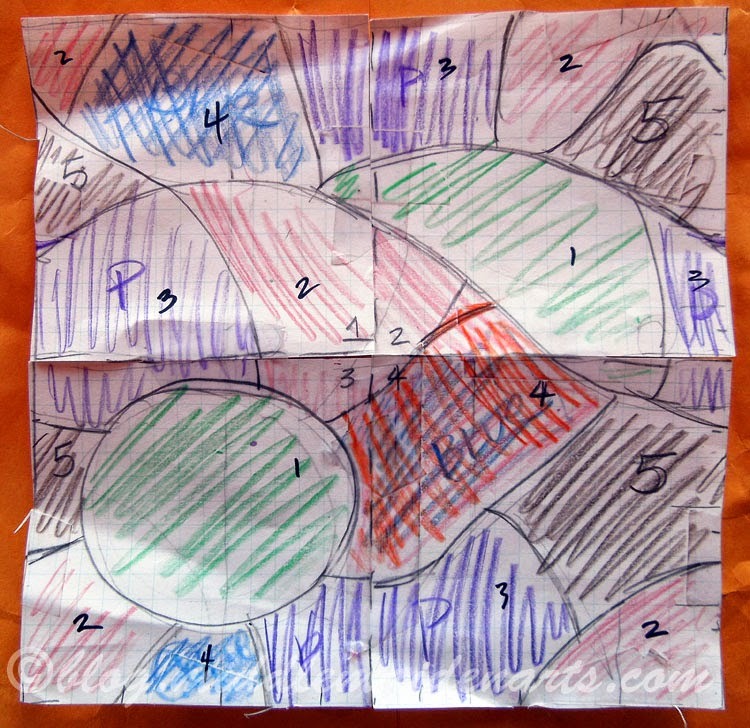 For each piece of fabric, I measured the stitched and stamped area and used an online site to calculate the most efficient ATC sized cutting layout for the fabric. (The site seems to have gone offline now but I found something similar for use on an iPad called Paper Layout). I drew the cutting layout lightly in pencil on the paper and fused it to the backside of the stitched fabric. Next, I cut the cards on the grid and pressed them with a hot iron a second time to be sure the fuse was complete. How to finish the edges? I made several tests and quickly dismissed the idea of stitching. I did not like the perforations on the paper or the way the stitched edge looked. Instead I decided to use the side of a small brush and craft paint to seal and finish the edges. Final steps – create labels to include date, swap title, and contact information. The next to last step was to sign my cards. Finally, and this should have been done before finishing the edges, I checked them all to be sure they would fit in trading card sleeves. Of course, some did not so I trimmed and repainted them. 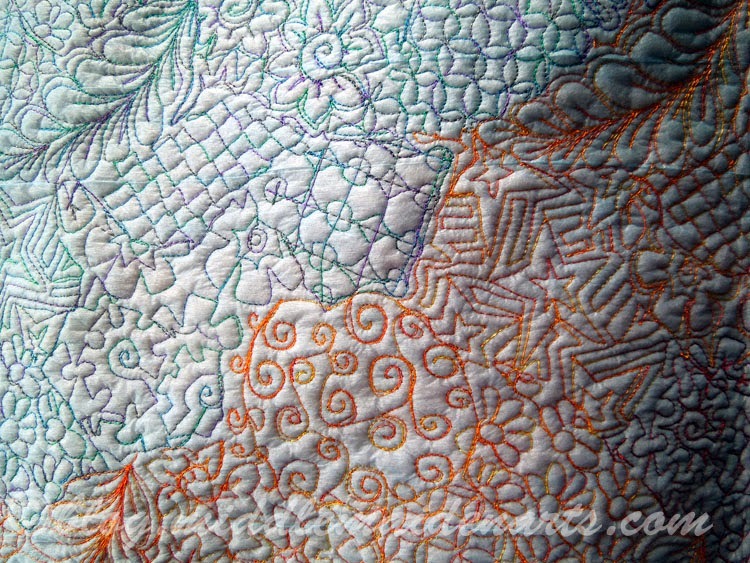 With my cards complete and in the mail, I created a small quilted piece for myself. It meets the criteria for another challenge project involving quotes and artwork. After binding the roughly 10” x 10” quiltlet, I free motion stitched my favorite mantra on the binding. I think I can. I think I can. I know I can. I did it!